Everything DiSC® is one of the most widely-used assessments in the world, with over 45 million users in 75 countries. Based on noted physiological psychologist and author William Marston’s 1928 groundbreaking work in the area of personality theory, the powerful DiSC® framework and tools have been rigorously researched for over four decades. Today, Everything DiSC®solutions provide rich and versatile learning opportunities to help people understand themselves and others. Helps learners improve self-awareness around conflict behaviors. Can be used with everyone in an organization, regardless of title or role. Get in-depth tips, strategies, insights into your style, and action plans to help you become more effective at work. 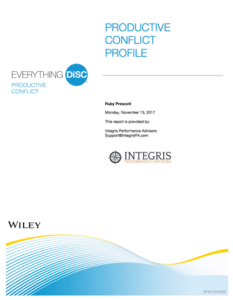 Rather than focus on a step-by-step process for conflict resolution, Everything DiSC®Productive Conflict helps learners curb destructive behaviors so that conflict can become more productive, ultimately improving workplace results and relationships. Ready to learn how your teams can curb destructive behaviors so that conflict can become more productive at work? Check out a sample profile and let us help you on your employee engagement journey.